During the weekend I updated all the servers at the customer. I expected everything to have gone well. On Monday morning I came to the office and found out that I had not updated the WSUS server itself. An error occured trying to connect the WSUS server. This error can happen for a number of reasons. Check connectivity with the server. Please contact your network administrator if the problem persists. With a bit of trying and Googling I finally came up with the solution. Let’s fix “An error occured trying to connect the WSUS server”. In the steps I assume that you are a system administrator and know how to deal with Command Prompt. If you don’t, you can always leave a comment. The problem should now be solved. Here is also a screenshot, as you can see my Command Prompt is elevated. It is also possible that within IIS your WsusPool has stopped. 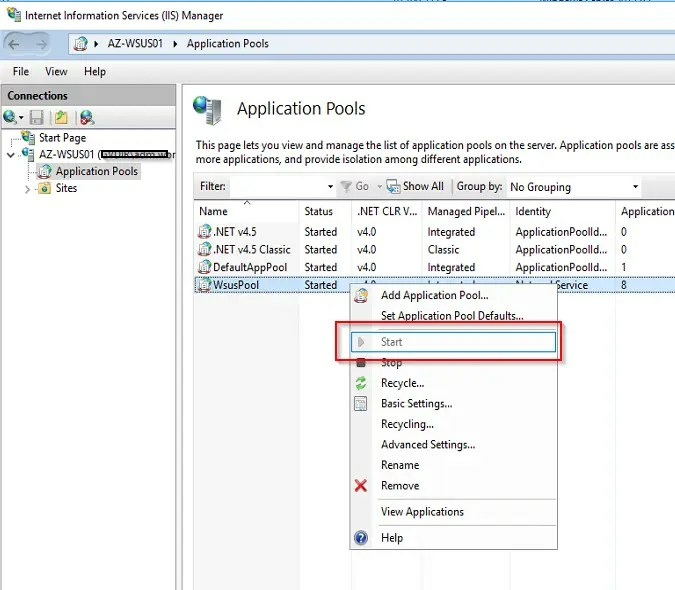 Open IIS and go to Application Pools. Right-click on WsusPool and start the Pool. Do you also use config manager in your infrastructure? And is my solution only a temporary solution? Then this Technet may help you further. System.IO.IOException — The handshake failed due to an unexpected packet format. System.Net.WebException — The underlying connection was closed: An unexpected error occurred on a send.